“Foreman” is a general term that refers to a specific type of manager, most commonly in construction or manufacturing. Across most industries employing the position, a foreman is typically the key point of contact between the ranks of management and labor. Construction foremen are responsible for supervising every aspect of a job. Strong abilities to work with, supervise and advocate for employees ensure that crews begin work on time, finish within designated working hours and comprehend and adhere to safety standards and regulations to optimize the operations aspect of the bottom line. Equally important, foremen work directly with project architects and outside contractors, holding accountability to these agents for primary onsite management and inspection of work to verify its overall quality. To this end, familiarity with relevant federal, state and regional building codes so that all completed work meets, or ideally exceeds, all requirements for quality and safety is a central responsibility as well. Regulations governing construction projects span virtually every aspect of development and are often very tight. They typically exist to meet insurance requirements, and practice of ascribed best practices of which all regulations consist are required of construction crews, contractors, and sub-contractors by the property developers. As a result, it's not at all uncommon for construction foremen to find themselves conversant with knowledge and experience well beyond his or her trade. The construction foreman has the burden of keeping all parties involved on the same page and ensuring that regulations are being followed to the letter. Not all of a foreman’s work is performed onsite. A construction foreman is also responsible for various types of office work. He or she is responsible for creating a work schedule to ensure that different parts of the job are completed in a specific order. A good foreman is able to identify those areas of a project most at risk of dragging a project behind schedule and taking necessary corrective action to ensure that projects stay on schedule and are completed by or ahead of the deadline. A construction foreman’s primary duties are managerial. Responsible for training, directing, supervising, and, if necessary, disciplining the crews and workers throughout the project, the foreman is expected to monitor employee efforts, evaluate progress, and provide workers with guidance and assistance to help increase efficiency. When grievances occur between employees or complaints related to the work environment are lodged, it is the foreman who acts as the liaison between labor and management. In developments involving unionized workers, it's necessary that the foreman know and understand what are often union-specific contract terms, to ensure that matters such as assigning overtime or executing disciplinary action meet the requirements of the union. 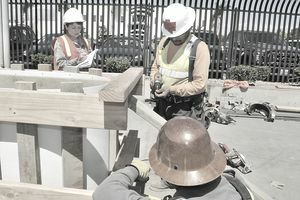 Construction foremen perform various duties vital to the organizational efficiency of a work site. The ability to read, follow sketches and blueprints and be savvy enough to make suggestions about changes whenever necessary is key. The ability to work well with private vendors and other outside departments and agencies to make sure every aspect of the project is covered and stays on schedule for completion is another important element. Construction foremen are also responsible for completing a broad range of paperwork. From a human resources standpoint, managing work schedules and keeping track of employee attendance in a way that keeps the project running within budget is one among many daily duties; and they also often conduct worker evaluations and participate in the hiring process. Foremen monitor inventory and place supply and material orders as required, all while adhering to project budgeting estimates. A foreman is expected to be an expert in the construction industry. While most of these positions are primarily management focused, a good foreman is also willing and able to perform hands-on work side-by-side with subordinates and to teach people how to execute tasks efficiently, correctly and within budget. A foreman’s path may differ somewhat from other managerial positions in that foremen typically earn their way into the position through years of on-the-job experience as opposed to education or formal training programs. However, construction foremen can—indeed, often do—pursue an education in areas of project management and building services in concert with, or in lieu of, real-world experience. Pursuing advanced education in either field adds formalized knowledge to hands-on experience in the construction industry, thus adds value to the resume and to the markets in which foremen serve.